See descriptions of my two novels below. A beautiful young woman recovering from a terrible plague fears she is the only person left alive on earth. Stranded alone until spring with no means of communication, she begins to believe a child is contacting her telepathically. 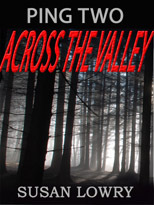 In a traumatic search to find him she runs into an attractive man with a dark and secretive past. Swayed by his insistence that her telepathy is imagined and that they must begin to repopulate the earth immediately, Kate is torn between Jack and her gut feeling the voices are real. The second book in the series is now available. The few survivors—preoccupied with their struggles to raise healthy children and preserve what they can of civilization—are unaware that eight-year-old Travis has a dangerous plan that will ultimately change their world in ways they could never have imagined. 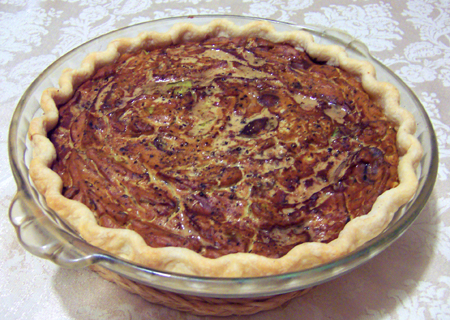 Lots of caramelized cremini mushrooms and onions make this tasty quiche a very satisfying brunch or dinner. The pastry recipe below is easy when made in a food processor. Or substitue your favourite gluten-free version. 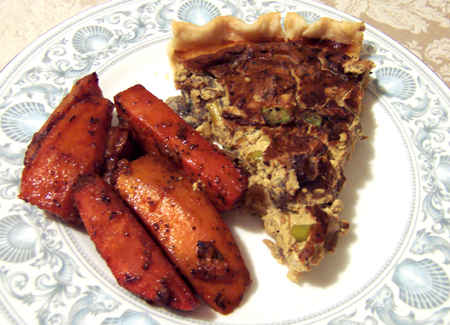 Left-over, seasoned mashed potatoes pressed into the bottom of a well-oiled pie plate would do the job deliciously. The recipe makes two 9 inch pies, but you can freeze one of them for later use, or half the recipe if you only need one. Sautee the onions in the oil on medium-low heat slowly until they are just starting to soften. 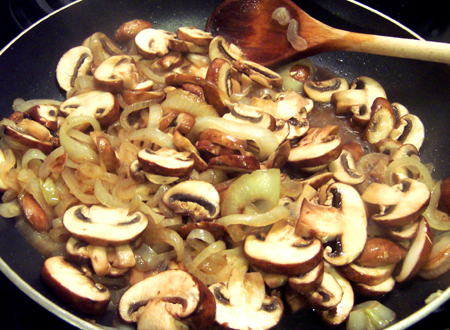 Then add the sliced mushrooms and cook, stirring frequently, until the mushrooms are nicely browned and the onions caramelized. The liquid from the mushrooms should have evapourated. Remove from heat. In a food processor, blend one of the blocks of tofu with the tamari sauce and then add the second one and all of the seasonings. Save the green onions for later. Pour the mixture into a bowl, add the caramelized mushrooms and onions and then green onions. Stir well, pour into the pie shells and spread evenly out to the edges of the crust. Sprinkle 1 tbsp. of sunflower oil and 1 tbsp. 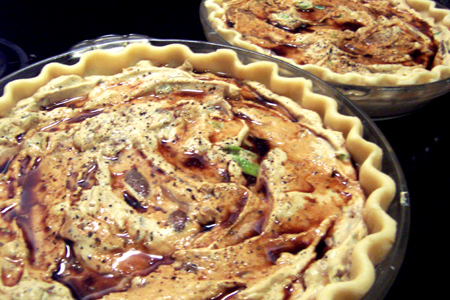 of tamari sauce over the top of each pie and tilt so that the liquid runs somewhat evenly over the surface. Then sprinkle generously with freshly ground pepper. Bake in a preheated 425 degree oven for twenty minutes. Reduce heat to 350, place pie rings over the edge of the crusts to prevent over-browning, and cook another 35 minutes. Place flour and salt in the food processor bowl. Pulse to combine. Add shortening. Pulse two or three times just until the shortening is broken into pea-sized bits. Add water while pulsing as few times as possible just until the pastry forms into a ball or holds together. Using a light touch is important for tenderness of the crust. Line countertop with two strips of plastic wrap. Roll out pastry and line two pie plates. Cut the dough 1/2 an inch from edge, fold under and crimp as in photo below. Wrap crusts in plastic wrap and put in fridge or freezer until ready to bake. Allowing the dough some time to rest and having it chilled when it goes in the oven helps to make the crust tender and flaky. You can read samples of my writing at my author website. For more fun join me on Facebook. 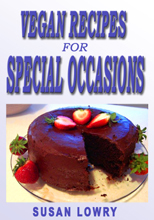 Now available, my handy ebook with a collection of delicious vegan recipes for entertaining! Please click on the picture to check it out! 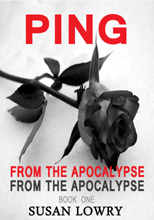 Please check out my novel Ping, available as an ebook at Amazon.com! Click on the picture to read about Ping. © 2009 to 2013 VeganOccasions.com All Rights Reserved.